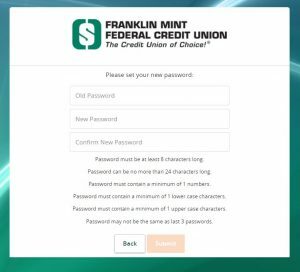 At FMFCU.org, log into Online Banking with your existing Login ID from our previous Online Banking from FMFCU.org. 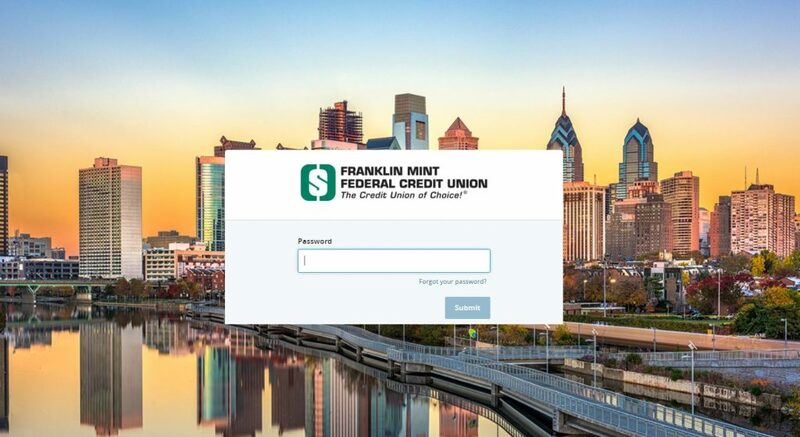 If you are the joint account holder, please register as a NEW USER to establish your own, unique sign-on. DO NOT sign in using your present credentials. Sign-ons are no longer shared. Elect where you would like to receive your Secure Access Code. Once you receive the code, enter it on the next screen. Register your device if on a network you trust. We recommend that you do not register if on a shared public wifi. Please note a Member Number can no longer be used as a Login ID and you will be asked to change it if you previously used one. Please take some time to verify all of your automatic transfers, account numbers, Bill Pay payees, and account activity. 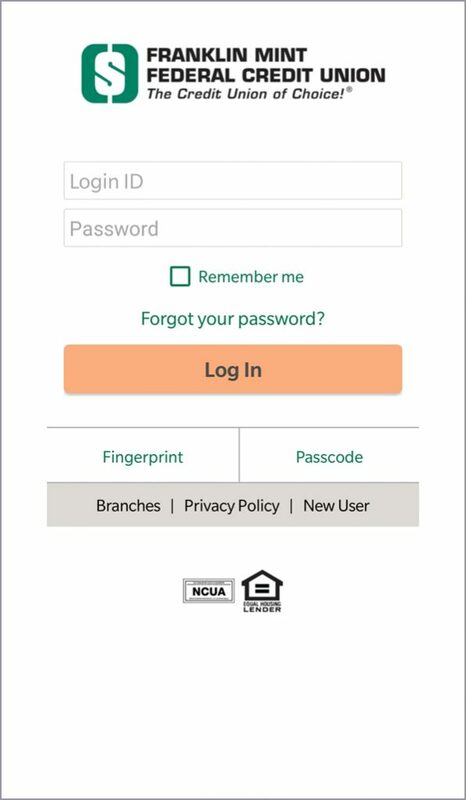 Enter your existing Login ID and password from our previous Online Banking or Mobile Banking. If you are the joint account holder, please register as a NEW USER to establish your own, unique sign-on. DO NOT sign in using your present credentials. Sign-ons are no longer shared. For account transaction history, click the account name to view the Account Details screen. From here you can view transaction details by clicking the transaction. You can scroll through Account Summary by clicking Next or Previous at the bottom of the summary box. Click the Edit button, and you will be directed to Account Preferences where you can modify the nicknames of accounts and the order in which they appear. 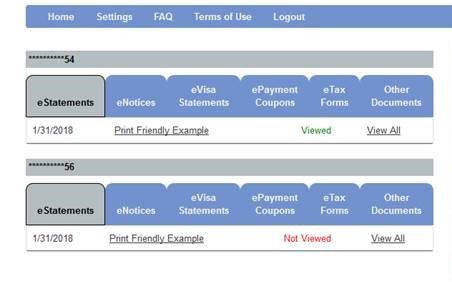 The Print button will print a quick summary of your current available funds in all accounts. If you are in a hurry, there is an option for easy access tools in the top right corner. These Quick Link options allow you to swiftly transfer money or apply for a loan. From your Home Page, click on an account for more information. For account transaction history, click the account name to view the Account Details screen. You can view transaction details by clicking that transaction. If you click on the icon associated with the transaction, it will allow you to view the image of a check or deposit slip. Click the icon to print the transaction you are viewing. If you choose to Show Filters, you can sort particular transactions to view, export, or print. Once you’ve made your selections, click Apply Filters. Click the icon to print your filtered transactions. When working from your computer, you can also Export a list of transactions. Money$mart - Budgets, Spending, Trends and more! With our new Online Banking and Mobile Banking platform, you now have a built in personal financial management tool integrated on your home screen. 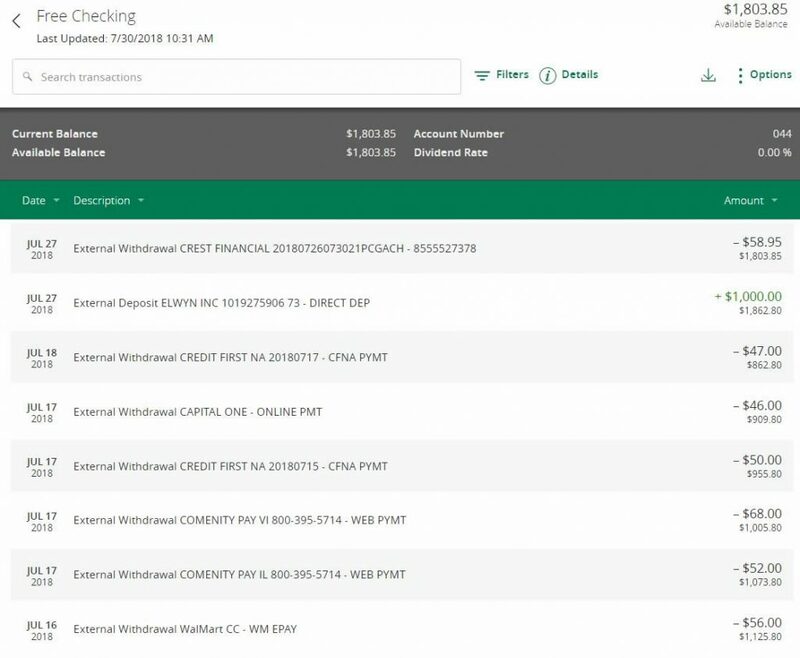 When you link in all of your external accounts from other financial institutions like credit cards, investments, and retirement accounts, a clearer and more complete financial picture become apparent to you with these tools. 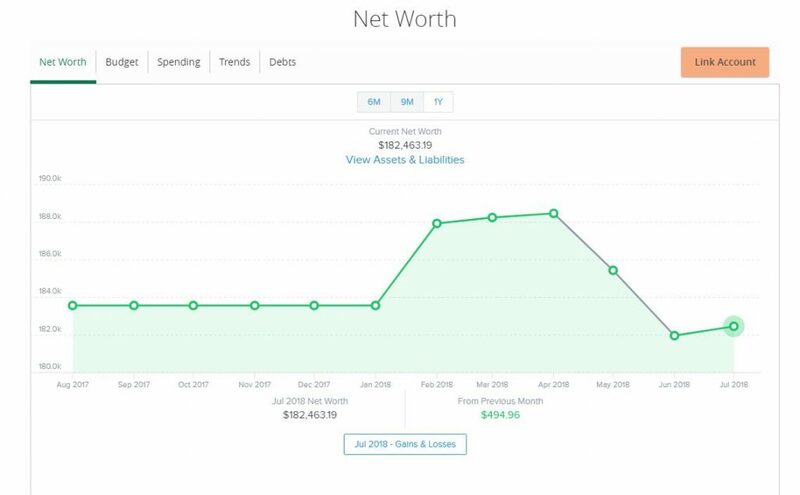 Get your net worth, generate a budget to help you stay on track, understand what you’re are spending your money on, view trends, and get control of your debts. Please note more tools are available on the desktop version than mobile. 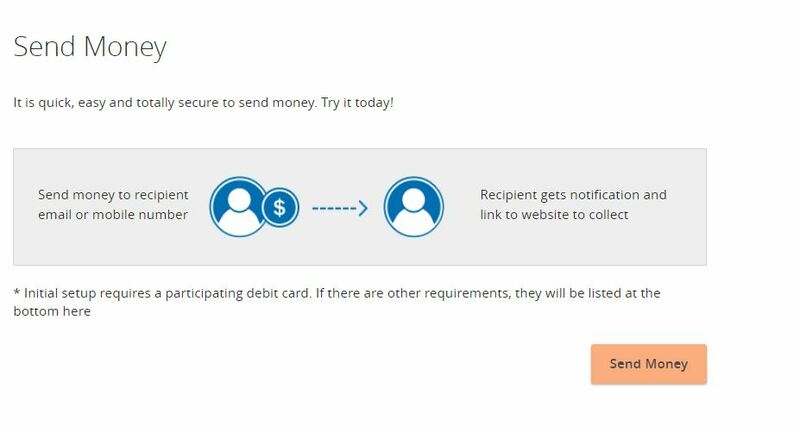 Unfortunately, due to the switch to a new Online Banking provider, all alerts you’ve set up in Money$mart will not transfer over so you’ll have to set them up again. These are awesome free tools we hope you take advantage. 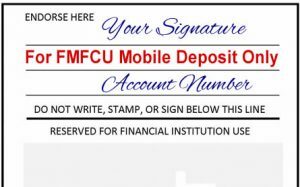 Messages allows you to communicate securely with FMFCU. Check here for alerts, replies to your inquiries, and Credit Union communications. 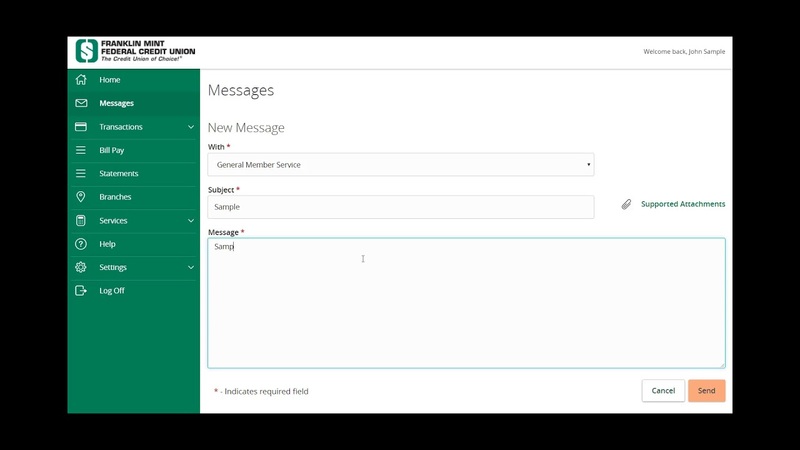 Messages are listed on the left side of the screen. Click the message that you would like to read, and the entire message will appear on the right. If you would like to delete a message, click the icon, or you can reply to a message by clicking the icon. Both icons are located in the upper right corner of a message. In the Transactions tab, click on Funds Transfer. Select the accounts that you wish to transfer funds From and To using the drop-down menus. 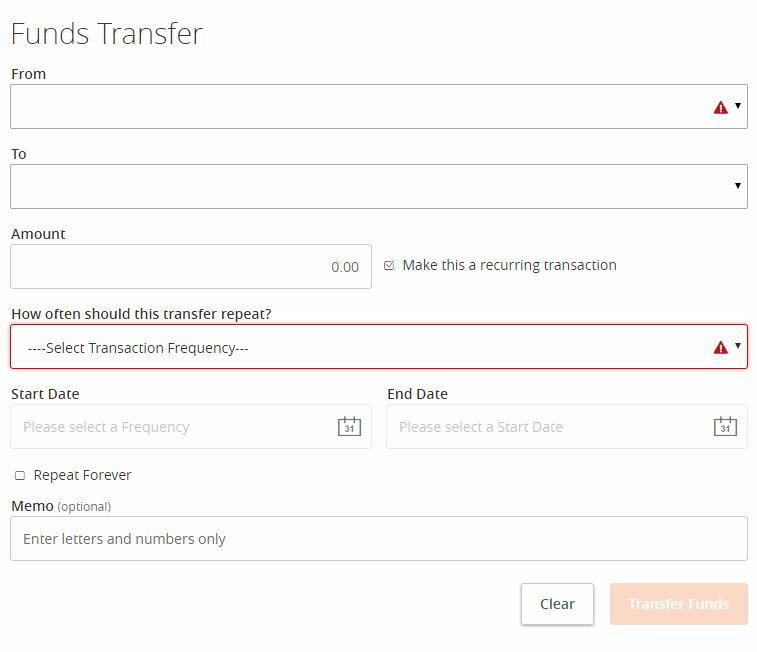 If you wish to set up a recurring transaction, click the check box “Make this a recurring transaction.” New input fields will appear, and you will need to specify the Frequency and Date range for this transaction. You can choose to make this transaction Repeat Forever by checking the box under Frequency. If successful, a screen with an overview of your transaction appears. All funds transfers appear in Online Activities, whether dated immediately or for the future. You can view them at this time, or you can click Close and review them at your convenience. Note: You can view or cancel unprocessed transactions by accessing the Recurring Transfer tab within Online Activities. 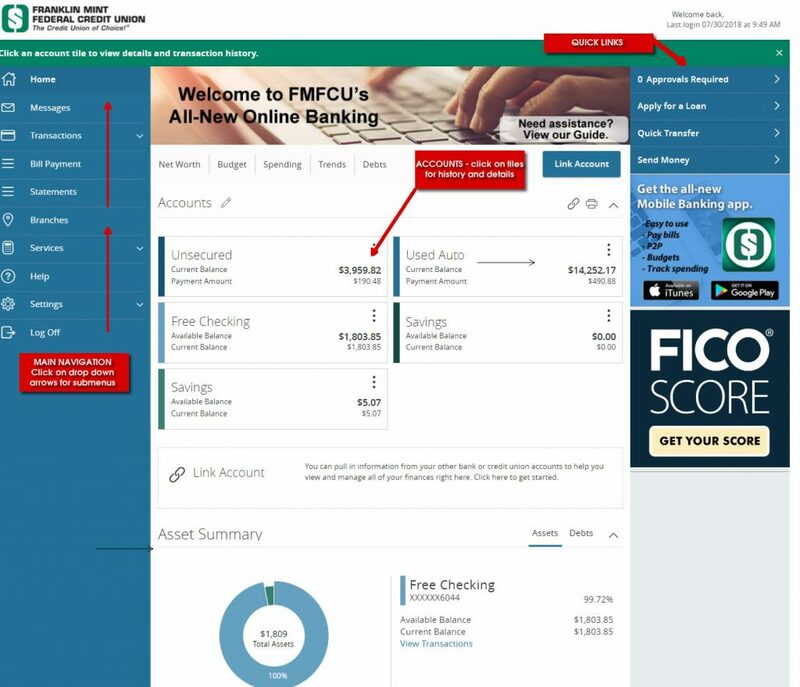 The Online Activities shows transaction activity initiated through Online Banking with FMFCU. Depending on the type of account and your accessibility, you can review, approve, and cancel unprocessed transactions. 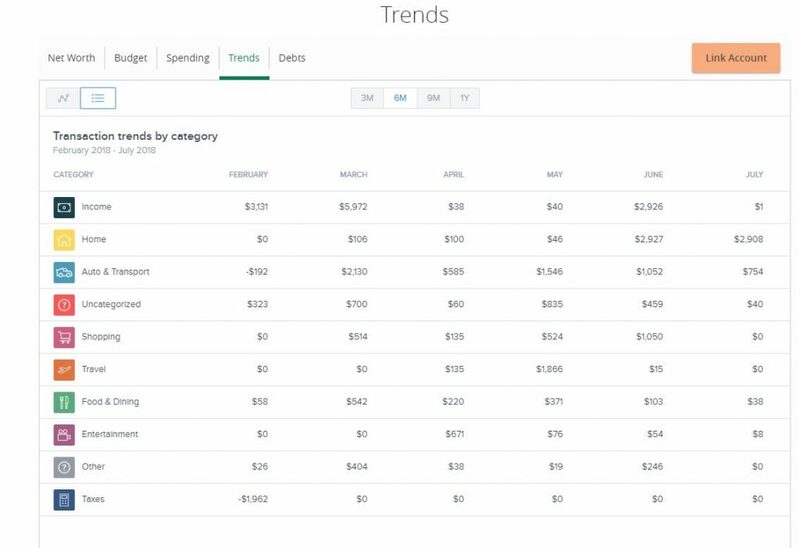 You can view the status, type, amount, date of activity, and account of debits and credits from single and recurring transactions. In the Transactions tab, click on Online Activities. 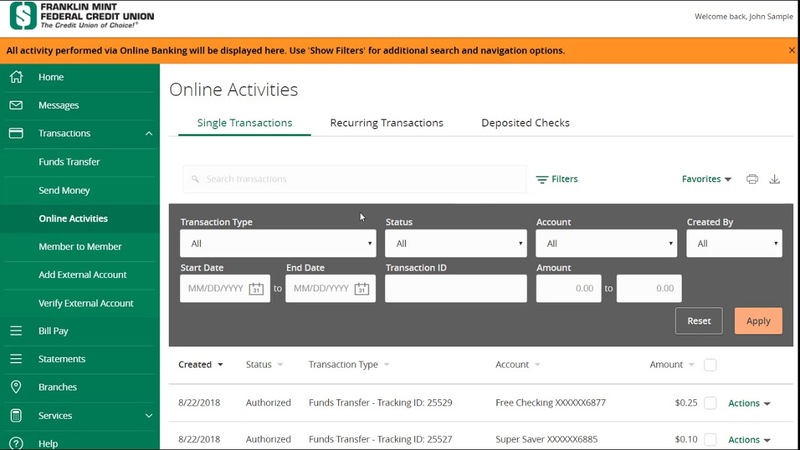 You can choose to view Single Transactions, Recurring Transactions, or Deposit Checks by clicking on the appropriate tab at the top. Click on a transaction to view more details. Click Show Filters for additional search options. Select Actions to perform additional functions, such as choosing to Copy a transaction. To download transactions into a money manager, click on the Export icon (arrow facing down) on the transaction page one of your accounts. Online Banking supports Spreadsheets (.xls, .csv), Microsoft OFX, Quicken, and Quickbooks. For complete Web Connect and Express Web Connect conversion instructions, it is important to read the guides for your version. 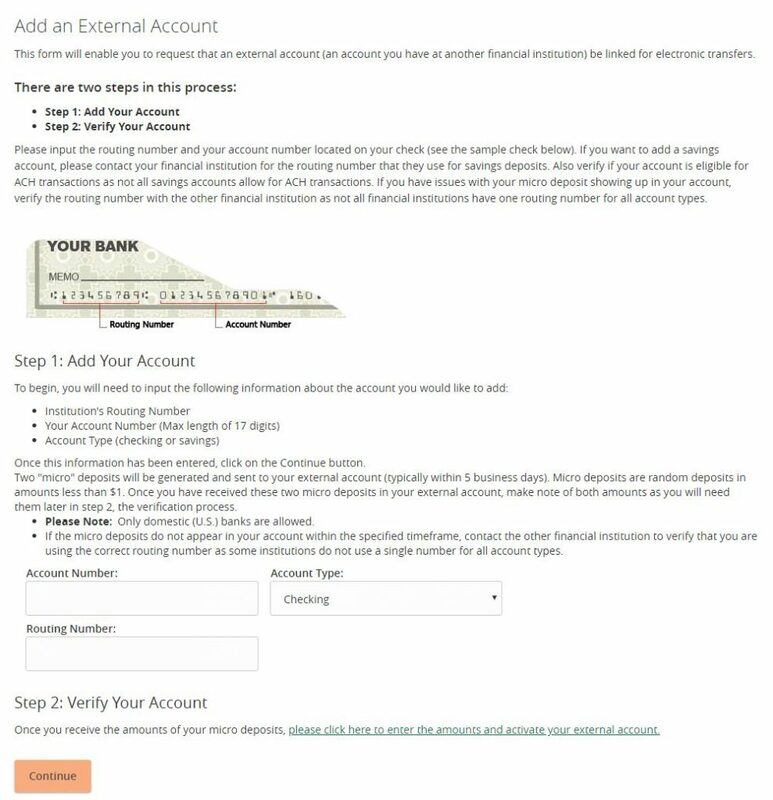 In order to transfer funds to an account outside FMFCU, you can use the External Accounts feature. This ensures your ability to make fund transfers to the outside account by integrating it into one, simple location. In the Transactions tab, click on Add External Account. check or deposit slip from your check book. From the drop-down menu, choose the Account Type. Click Continue. In two to three business days, you will receive two microdeposits in the external account to show that the process has been initialized. 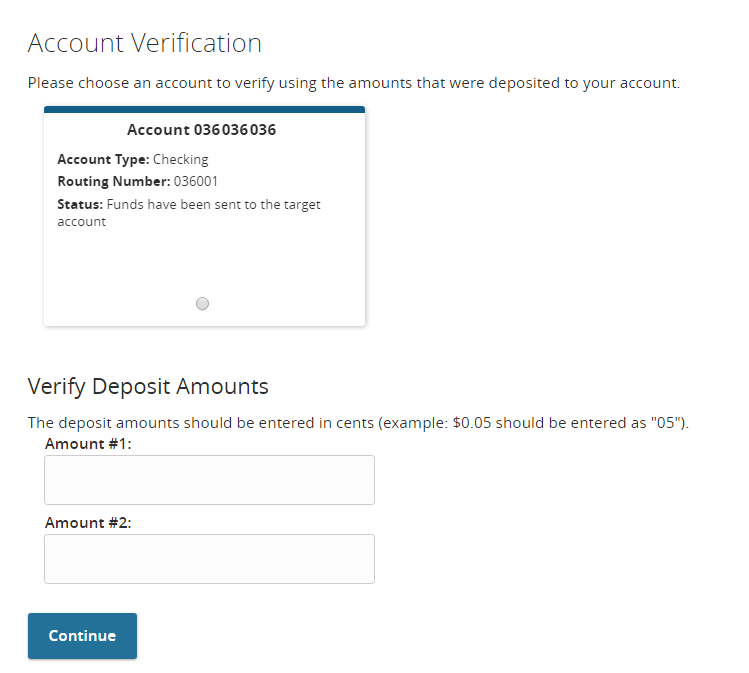 Once you receive those deposits, go to the Verify External Account tab to enter the amounts and activate your external account. your ownership of the outside account. In the Transactions tab, click on Verify External Account. To begin, select the Account you would like to verify. Enter the amounts of the micro-deposits that have been made in your external account. With the Member-to-Member Transfer feature, you can send money to any member of FMFCU who has Online Banking. If this is someone that you regularly send money to, you can link their account for deposit purposes. In the Transactions tab, click on Member to Member. Link Account for future use. For a Single Transfer, use the drop-down to choose the From Account where funds will be taken out of. Enter a Description of the transfer in the provided box. Enter the required information for the person you wish to receive the funds. If you would like to link this account for future use, click Link Account on the first window. Fill out the requested information, then click Submit. It is important to maintain current contact information. Address changes are intended to only change the address of the registered online banking user. Any other household members must complete their own address change form by logging in with their own credentials or by visiting a branch. In the Settings tab, click on Update Contact Info. 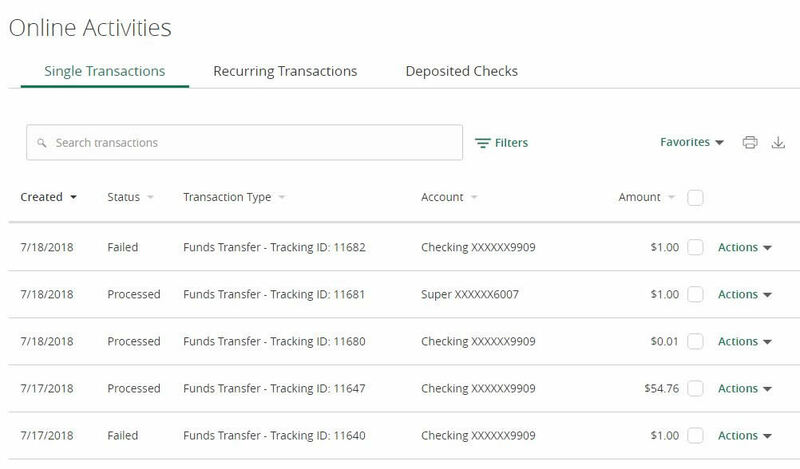 Under Transactions, click on Deposit Checks. Failure to do so will void the transaction. FMFCU statements will look similar after the System Enhancement. However, your account detail may appear different. 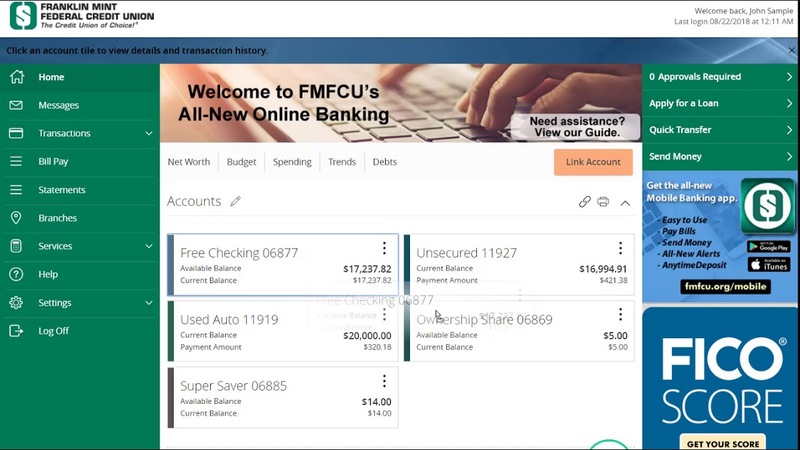 Look for easy to read account summaries, transactions and balances. 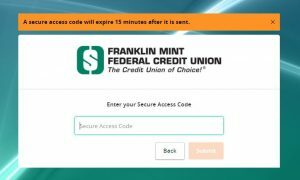 FMFCU’s Send Money Person-to-Person (P2P) payment service, allows you to send funds to another person from within Online Banking and Mobile Banking. All you need is the person’s email address or mobile number, access to Online or Mobile Banking, and the personal identification number (PIN) for your debit card. Recipients do not need to enroll in P2P, nor do they need to use the same financial institution. After accepting the Terms and Conditions the first time they use the service, recipients only need to provide a name, debit card number, and card expiration date. If funds are deposited into an account that belongs to a participating network, funds are immediately available. Otherwise, the transaction is processed via the Automated Clearing House (ACH) network and funds will be available in 1 to 3 days. Click or tap Transactions > Send Money. Note: On the initial visit the user will need to accept the terms and conditions for the P2P service. Upon which the system will automatically register the user (name, email address, etc). The user will then be prompted to enter their debit card number, the expiration date, along with an optional nickname. This information will be encrypted and sent securely to the P2P service provider (First Data). First Data will ensure that the card is an eligible card issued by the FI and has the correct sequence of a valid card number. From here the user is ready to conduct a P2P transaction. On the Send Money page, enter the recipient name. As you enter characters, suggested recipients will appear if the characters match the names of any previous recipients. Note: On a mobile device, you can tap the Contacts icon () to select a recipient from the list of contacts stored on your device. 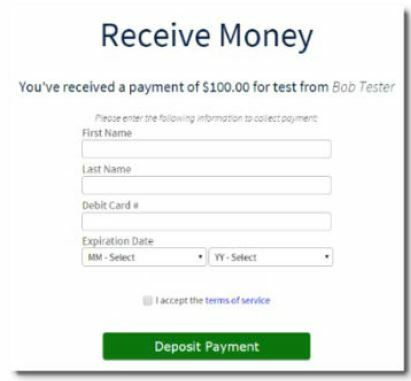 Enter the Email address or Mobile # of the person to which you are sending funds. Select the Debit Card from which you are sending funds. Note: Memos can be up to 40 characters long. However, if you send funds via text message, some characters may be not appear properly. When the PIN pad appears, click or tap the first digit of your debit card PIN. The PIN pad scrambles digits each time you click or tap a digit. This feature is designed to keep the transaction secure in case your computer, tablet, or smartphone is infected with viruses or malware that track keystrokes. The transaction will be cancelled if two consecutives, unsuccessful PIN entries occur. When finished selecting PIN digits, click Submit PIN to complete the transaction. 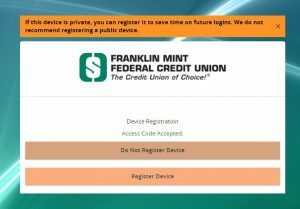 Using Online Banking with FMFCU you can initiate a Stop Check Payment request from any device. You can review the status of your request in the Activity Center. The stop payment, once confirmed, will remain in effect for six months. The current fee for a stop payment is $35. In the Services tab, click on Stop Payment. Choose Request type, either single or multiple checks. 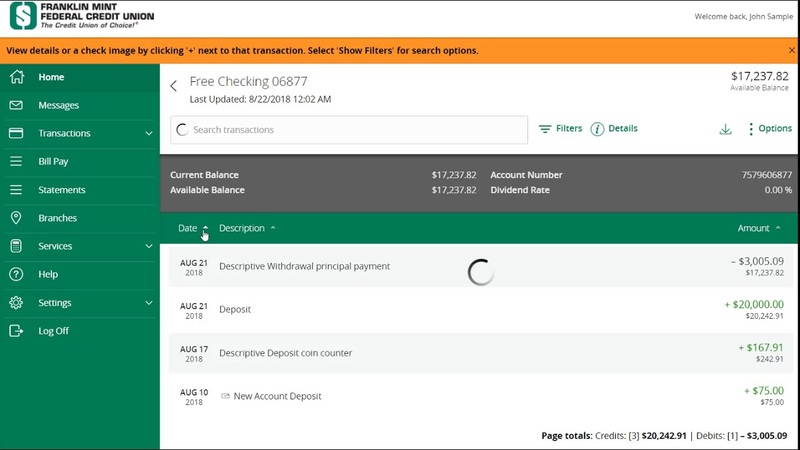 Click on each category header on the left to select an Account, enter a Check Number, Amount, and choose the Date of the check. Be sure to click Save when changes are made. 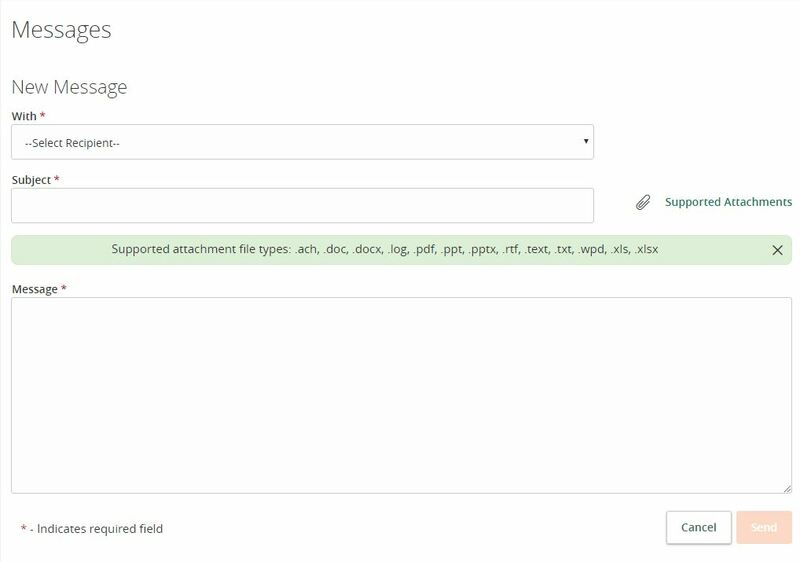 When complete, click Send Request. You can create and manage alerts to remind you of important dates, warn you about the status of your accounts, and tell you when certain transactions occur. 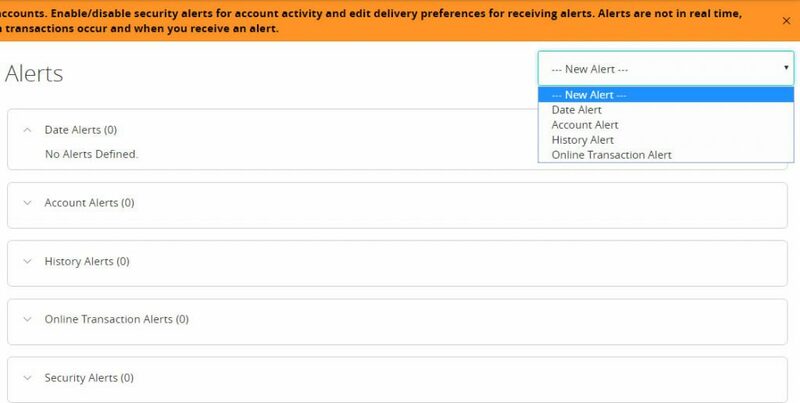 When you create an alert, you specify the conditions that trigger the alert as well as the delivery option to receive that alert. All alerts will automatically be sent to your Online Banking account via Secure Messages, regardless of the additional delivery preferences you have chosen. 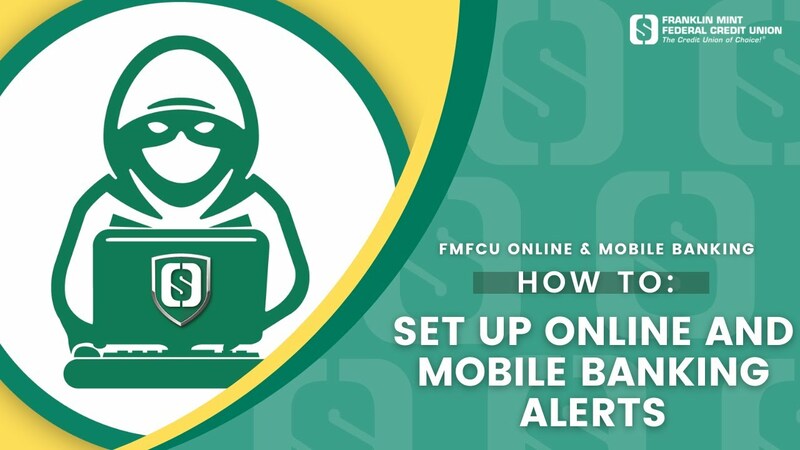 Please note: Alerts from FMFCU’s previous Online Banking will not transfer over. You must create new alerts. We think you’ll love them more than ever. Give them a try! and Security Alerts and edit their delivery methods. To create a new alert, click the New Alert drop-down. Choose the kind of alert that you wish to create from the drop-down. A new screen will appear where you can enter the necessary information. Be sure to click Save when you are finished. You can easily turn an alert On/Off without deleting it by toggling the Enabled button. To view or change details of an already-existing alert, choose the Edit link on the right end of the one you would like to edit. Be sure to click Save after you change any alert details. FMFCU Online Banking includes some great themes to choose as your background. We’ve even created our very own “Philly Proud”, an awesome later afternoon panoramic view of the city behind the Schuylkill River. Plus, we’ve also included a Spanish language theme for the first time ever! Just go to Themes and select the one you want. Security Alerts let you enable specific alerts to keep you informed of changes to your account and Online Banking profile. Alerts can be delivered via Secure Message within Online Banking, email, SMS text message, or phone call. In the Settings tab, click on the Alerts tab, then click Security Alerts. top. These changes will apply to all Security Alerts. Enter the information for your preferred delivery method. Security starts at your computer. Never share your Login ID or password with anyone, and always keep your login information in a safe place. To make your passwords hard to guess, avoid using your pet’s name, hometown, or other personally identifiable choices and combine random numbers instead of using your birth date. 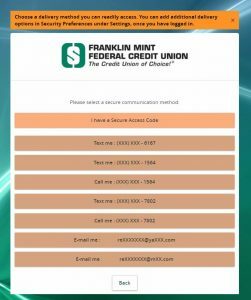 PLEASE NOTE: With the new Online Banking and Mobile Banking platforms, you will not be able to use a member number as a Login ID. The system will prompt you to change it. Memorize your passwords and change them regularly. Exit your Online Banking session when finished. Do not leave your computer unattended when logged in to Online Banking. Do not access Online Banking on public computers or unsecured Wifi networks. If you receive an error when logged in to your account, report the error to a Member Relationship Advisor at 610.325.5100. Need a quick balance, transfer or history? Text Banking is lightning fast for those simple banking needs. For example, if you need a balance, just text BAL to 226563. Instant balance is texted right back to you within seconds. It’s very convenient without ever having to login to the Mobile App. In Online or Mobile Banking, just enroll under Settings. Enter your mobile phone number, agree to the terms and you’re all set. You’ll receive a welcome text to start.